Objective To evaluate the evidence regarding (1) factors affecting return to school (RTS) and (2) strategies/accommodations for RTS following a sport-related concussion (SRC) in children and adolescents. Design A systematic review of original studies specifically addressing RTS following concussion in the paediatric and sporting context. Data sources MEDLINE (Ovid), Embase (Ovid), PsycInfo (Ovid) electronic databases and the grey literature OpenGrey, ClinicalTrials.gov and Google Advanced. Eligibility criteria Studies were included if they were original research on RTS following SRC in children aged 5–18 years published in English between 1985 and 2017. Results A total of 180 articles were identified; 17 articles met inclusion criteria. Several factors should be considered for RTS after concussion, including: symptomatology; rest following injury; age/grade; and course load. On RTS after concussion, 17%–73% of students were provided academic accommodations or experienced difficulty with RTS. Students were more likely to obtain academic accommodations in schools with a concussion policy if they had a medical RTS letter and had regular medical follow-up after concussion. Conclusions Schools should have a concussion policy and offer individualised academic accommodations to students recovering from SRC on RTS; a medical letter should be provided to facilitate provision/receipt of academic accommodations; students should have early, regular medical follow-up following SRC to help with RTS and monitor recovery; students may require temporary absence from school after SRC; clinicians should assess risk factors/modifiers that may prolong recovery and require more intensive academic accommodations. Several consensus/position statements and guidelines have addressed RTS after concussion.12–16 Following the Fourth International Consensus Conference on Concussion in Sport, the ChildSCAT3 assessment tool was developed for children aged 5–12 years, with a child-specific symptom scale and recommendations for RTS. The Concussion in Sport Consensus Statement also addressed children’s cognitive requirements and need for school accommodations.17 However, these resources have been based on limited empirical research. Many areas of RTS lack evidence-based guidelines. What factors must be considered in ‘return to school’ following concussion? What strategies or accommodations should be recommended in ‘return to school’ following concussion? 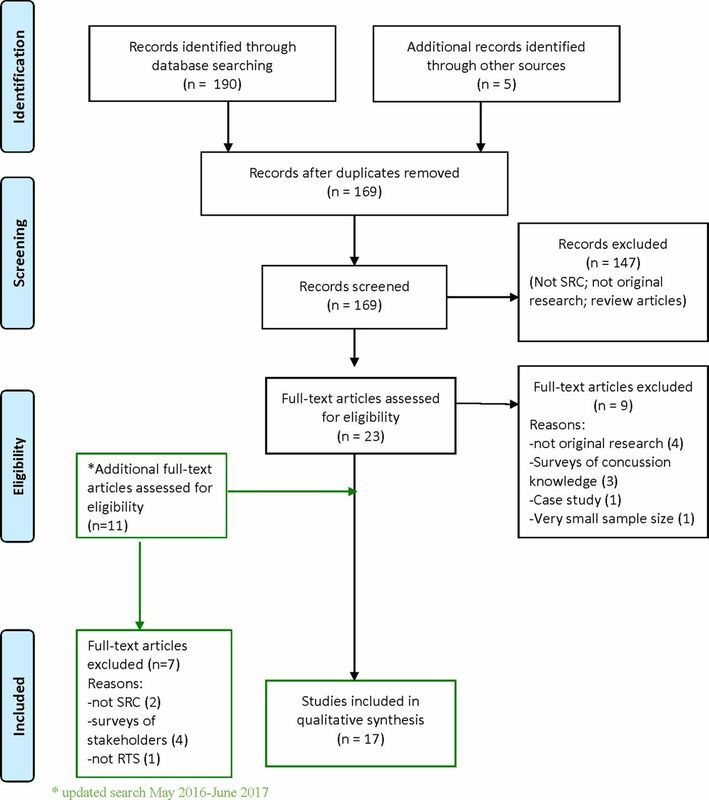 This systematic review was conducted as part of a larger review on differences in concussion management between children and adults, which was presented at the Fifth International Consensus Conference on Concussion in Sport.18–20 However, it represents a more detailed analysis of RTS in children and adolescents following SRC. This systematic review was prospectively registered in the PROSPERO database (registration number CRD42016039184). The search strategy (box 1) was developed in collaboration with a specialist librarian. Electronic databases searched were Ovid MEDLINE, Ovid Embase and Ovid PsycInfo, in addition to reviewing reference lists of retrieved articles and published articles by the authors to identify any potentially eligible articles not identified by the electronic database search. Three grey literature repositories (OpenGrey, ClinicalTrials.gov and Google Advanced) were searched. The searches addressing both questions (factors and accommodations) were run concurrently; however, the results were analysed separately. ((mild or minor or minimal) adj (traumatic brain or tbi)).tw. (((severe or moderate) adj2 (head or brain or traumatic or tbi)) not (mild or minor)).ti. 8 and (child* or adolescen*).mp. (return* adj3 (school or learn*)).mp. (minors or minors* or boy or boys or boyfriend or boyhood or girl* or kid or kids or child or child* or children* or schoolchild* or schoolchild).mp. or school child.ti,ab. or school child*.ti,ab. or (adolescen* or juvenil* or youth* or teen* or under*age* or pubescen*).mp. or exp pediatrics/or (pediatric* or paediatric* or peadiatric*).mp. or school.ti,ab. or school*.ti,ab. between 1985 and May 2016 (results presented at the Berlin meeting). The search was repeated for this updated review to include studies published between the initial search and June 2017. Studies evaluating patients with mixed mechanisms of injury were included if SRC was part of the study population. As well, studies with mixed age cohorts were included if there were sufficient numbers of children/adolescents less than 18 years of age. In addition, studies examining cognitive activity/rest or cognitive impairment following SRC were included as a proxy for school effects following concussion. All titles and abstracts identified by the search were reviewed independently by two of the authors (LKP and GAD) and the full texts of all potentially eligible articles were obtained and reviewed. The final selection of articles was determined by consensus among the authors. The following data from the included studies were inputted into a data extraction table independently by LKP and GAD: study design; participant characteristics; exposure/intervention; outcome; results; limitations. Two authors (LKP and GAD) independently assessed the quality of each study using the Downs and Black (DB) checklist.21 This tool can be used for randomised and non-randomised study designs. Discrepancies in DB scoring were resolved by consensus. The level of evidence for each study was assessed independently by each of the authors using The Oxford 2011 Levels of Evidence.22 All authors agreed on the assessed levels of evidence. Preferred Reporting Items for Systematic Reviews and Meta-Analyses (PRISMA) flow diagram. RTS, return to school; SRC, sport-related concussion. Adolescents/high school students tended to have more symptoms, more severe symptoms and more difficulty with RTS than younger students, and took longer to recover.29 30 34 39 Age 13 years old and greater was a predictor of persistent concussion symptoms in a recent prospective, multicentre ED cohort study.46 The reasons for age and school level differences are unclear but may reflect the nature of injury manifestation in adolescents; increased academic and social demands; greater challenges to implement consistent, coordinated management strategies across multiple classes/teachers; and greater independence and decreased supervision in compliance with medical recommendations. These studies, however, sampled children and adolescents from specialty clinics, which may represent an overall higher symptom burden and severity, and therefore may limit the generalisation of their findings. Lack of rest, both cognitive and physical, immediately following concussion has also been associated with persistent symptoms. Higher cognitive activity, such as school attendance, may cause exacerbation of symptoms and prolonged recovery from concussion, as well as longer RTS.11 24 28 32 Student-athletes who continued to play after injury took twice as long to recover and were almost nine times as likely to have prolonged recovery (>21 days) compared with those who were removed from play immediately after injury.47 Although RTS was not specifically assessed, cognitive performance was lower and symptoms higher in adolescents not removed from play immediately after concussion.47 The presence of risk factors/predictors of persistent symptoms should prompt practitioners to be more cognisant of potential difficulties in RTS and the need for more support in the RTS process. An additional factor possibly affecting RTS after concussion is SES, though it requires more detailed study to fully understand its significance. The type of family insurance (private vs public), as a proxy for SES, may impact length of school absence following concussive injury, with concussed student-athletes with private insurance missing more days of school than those with public insurance.33 The reasons for this difference in school attendance were not identified; however, the study population represented only about 40% of the cohort and 90% had private insurance, raising concerns about external validity and selection bias. As well, five other markers of SES were not associated with differences in recovery, which makes the significance of SES in concussion recovery unclear. Very likely there are other factors and specific deficits after concussion, such as autonomic dysfunction, that may impact on RTS that have not yet been studied in that context. Significant numbers of symptomatic students (17%–73%) may require academic accommodations on RTS after concussion29 35 37 39; however, it is encouraging that a recent study found minimal long-term effects of concussion on academic performance in high school at a population level.48 A range of strategies/accommodations to support RTS following concussion have been proposed, including temporary school absence.12–16 35–37 39 In the initial few days following a concussion, students may need to stay home with relative restriction of physical and cognitive activities to allow acute symptoms to improve. Exacerbation of symptoms on RTS may indicate suboptimal accommodations or students pushing through symptoms. A secondary analysis of Thomas et al’s study38 found that symptom spikes were associated with abrupt increases in mental activity, such as school attendance and extracurricular activities, in some patients but that most students were able to RTS without symptom exacerbation.11 This analysis found that symptom spikes were associated with higher symptom burdens and may be unrelated to physical or mental activity but rather other factors, such as stress or poor sleep. Conversely, some evidence indicates that longer restriction of activity, including school absence, may prolong recovery and increase symptoms.38 However, the optimal length of school absence has not been determined, and is likely to vary according to type, severity and duration of symptoms. Further study of when to recommend RTS is needed to guide clinical practice. reduced visual and auditory stimulation. While evidence is emerging, this review highlights the lack of research to guide RTS following SRC in children and adolescents. The studies identified had high risk of bias and study designs were mostly lower levels of evidence (3 or 4); there were only two RCTs. Many questions remain unanswered, such as the optimal length of school absence following SRC and what specific accommodations should be offered. There is an urgent need for high-quality research on SRC in children and adolescents, including RTS, to better inform management guidelines. RTS has been only a recent focus of concussion management and this study identified only 17 studies on this topic. The reviewed studies involved mostly high school and college students, many with mixed age cohorts (children, adolescents and adults). Despite the explosion of concussion research in the last decade, little research has been conducted in children 5–12 years of age. In addition, some studies included non-SRC and did not focus on RTS after concussion. Since we included only English language studies, these results may not be culturally generalisable and there may be language bias. Other factors limiting generalisation of these review findings include study design, location and sample size. Level 1 evidence was not available as the majority of studies were retrospective and cross-sectional designs, with only two lower quality RCTs. Most papers had external validity and recall bias, particularly those conducted in hospital ED and specialty concussion clinics. Some studies had small sample sizes and used variable definitions of concussion and prolonged recovery. Finally, many of the studies examined school issues/outcomes at a time when there was little guidance on effective in-school management and support. With more informed guidance about RTS and provision of effective symptom-directed accommodations, RTS outcomes will likely improve. For analysis of risk of bias, we employed the Downs and Black checklist, which was developed as a tool to be used in reviews of non-randomised studies. While we accept that the Downs and Black checklist has its limitations, and is not a perfect fit for this systematic review, it was deemed the best available for this study. An alternative risk of bias tool that would be more appropriate to the topic of RTS after paediatric concussion has yet to be developed. Schools should have a concussion policy which includes concussion education for teachers, staff, students and parents; defines individuals within the school to direct the provision of individualised student supports; and includes a mechanism to implement and monitor appropriate academic accommodations to students recovering from SRC. On diagnosis of concussion, students should be provided with a medical letter to facilitate the provision/receipt of necessary academic accommodations. Students should have early, ongoing medical follow-up following an SRC to identify symptom targets, monitor recovery and aid with RTS, with regular communication between the medical provider, family and school. Students may require temporary absence from school after concussion. Factors such as age/grade, types and severity of symptoms should be considered in determining the length of school absence. An individualised gradual RTS plan should be considered based on recovery trajectory. Clinicians should screen for specific deficits, such as visual and vestibulo-ocular disturbances, that may affect RTS and require symptom-specific academic accommodations, as well as assess risk factors/modifiers that may prolong concussion recovery, requiring more intensive academic accommodations. In particular, adolescents may require more academic support. Future high-quality research should be conducted to determine the criteria for length of absence from school, and appropriate, individualised RTS accommodations that should be provided for children and adolescents with typically recovering and prolonged SRC symptoms. Students should rest physically and cognitively initially following a concussion with a gradual increase in activities as symptoms allow. RTS following SRC requires cooperation and communication between healthcare providers, school personnel, parents/caregivers and the student to ensure that individualised accommodations and support are provided to facilitate optimal recovery. The effects of sport-related concussion (SRC) in children and the recovery challenges are different from adults. Adolescents may take longer to recover from SRC than adults and younger children. Return to school should be a priority in the management of children and adolescents following SRC. Factors such as symptomatology, age/school level, course load and rest after injury can affect return to school following SRC. Schools with a concussion policy tend to offer more academic accommodations to students recovering from SRC. Regular medical follow-up after concussion and provision of a return to school letter can help facilitate the provision of academic support. Many students require a brief absence from school and academic accommodations on return to school following an SRC to avoid significant exacerbation of concussion symptoms. The authors gratefully acknowledge Helen Baxter, Austin Health Library, with peer review of search strategy, and Margaret Sampson for assistance with drafting the search strategy. Centers for Disease Control and Prevention. Nonfatal traumatic brain injuries related to sports and recreation activities among persons aged ≤19 years--United States, 2001-2009. MMWR Morb Mortal Wkly Rep 2011;60:1337–42. Guidelines for diagnosing and managing pediatric concussion. 1st edn: Ontario Neurotrauma Foundation, 2014.
. Premature return to play and return to learn after a sport-related concussion: physician’s chart review. Can Fam Physician 2014;60:e310–e12-5. Ontario Ministry of Education. Policy/program memorandum no. 158: school board policies on concussion, 2014. Contributors All authors contributed to the development of the search strategy. LKP and GAD ran the searches independently and reviewed the results, selected the papers and compiled the data extraction tables as well as the risk of bias assessment. GAG identified additional pertinent studies for inclusion in the systematic review not identified by the search strategy and provided a template of the RTS letter in Appendix A. All authors contributed to the writing and critical review of the manuscript. Competing interests LKP and GAD received travel expenses for the Berlin Concussion Conference in October 2016. Presented at This study was presented in part at the 5th International Consensus Conference on Concussion in Sport in Berlin 2016, and some of these results were published with the conference proceedings.